The meta juju of each jewelry piece is what MetaJuju is all about. Read on to learn about the physical and metaphysical healing properties of our beads, and the process of making jewelry and malas. Q: There’s a lot more to making a mala than just tying knots, so let’s walk through the steps for each piece you design. XTY: Here are steps I follow for every mala I design. The first and most important step is sourcing quality materials. I attend the Tucson Gem and Mineral Show every year, the largest gem show in the world. I am trying to get as close to the source as possible. Ideally, I would love to be picking the stones out of the ground and polishing them into beads myself! Obviously I can’t do this, so I am looking for the energy coming out of the earth. I work to get the cleanest, highest vibration stones possible. I like to touch them before I buy them (just like with clothes!). There are so many things done to gemstones that can change the vibrations:dyed, radiated, stabilized.. so hold them to see how they feel. If it feels like plastic, it probably is. Bottom line, you get what you pay for. I ask where things are from and buy directly from mine owners whenever possible. For example, Pietersite is one of my favorites, and I only buy it directly from the mine owners while in Tucson. Q: Let’s talk more about the Gem Show later, So you've purchased gemstones you feel good about. And then what? XTY: Water cleansing. I cleanse all new stones in rain water, ocean water or river water, depending on the temperatures. Because water freezing inside can crack the stones, the material could change with the temperature, it’s a natural material affected by nature. Then, after a water bath, I lay them out to bask under the next full moon. Moonlight further cleanses and re-aligns the energy of the stones. A piece of jewelry starts with the third step: choosing the stones. To create a mala I start with an intention for the piece, or if it’s a custom mala I start with the recipient’s astrological birth chart. I take into account what Elemental Energies are needed, Chakras to balance, and the overall look for the finished piece. I string a ‘rough draft’ to see the finished design. I send photos of design ideas for approval, including the different possible ways to finish the mala-with a stone, tassel, pendant, or combination of these. 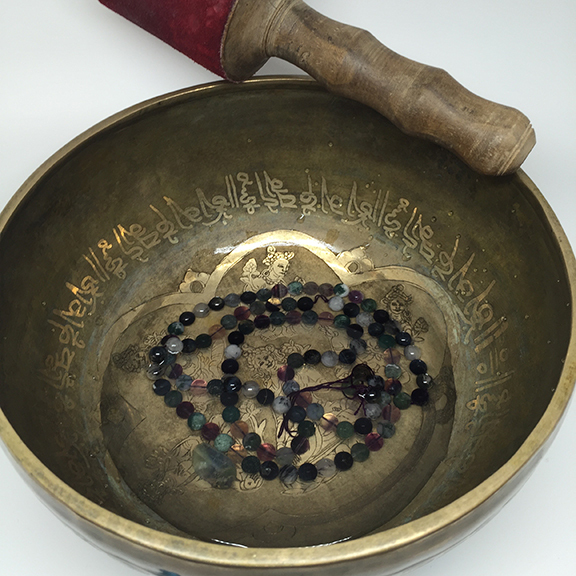 Once the design is finalized, I put the strand in a Tibetan singing bowl with sacred water. This sonic attunement harmonizes the energies of the chosen stones. The fifth step is the final stringing and knotting of the beads. I always use silk string. And it’s so important to do this step when I’m feeling positive because this state enables the most healing thoughts. When the mala is finished, I choose a mantra based on the mala's particular energy. I practice one round of the mantra with the mala before sending to its new home. Lastly I write up a card of all the information I have about the gemstones and the provided mantra, The info is also available website to be referenced later. It’s important to maintain the energy of the mala once you start wearing it. Events and other people's energies can affect the energy of objects. Cleanse and recharge your mala weekly or monthly-whatever feels necessary. Malas are shipped with a piece of Selenite, a stone that cleans the energy around it. Store your mala with the Selenite when not wearing it (being mindful of the fragile nature of raw Selenite) Or, you can put it in a bowl of Himalayan salt, (unless the mala has stones that scratch easily) or put it outside in a rainstorm if it’s not too cold. On a full moon, hang it in a tree or a plant in the moonlight, outdoors if possible. Be sure to bring it back inside before the sun gets too high because direct bright sunlight can affect the color of natural stones. The nature of silk is that it will not last forever so plan on having it restrung eventually, especially if you get the mala wet. During restringing, if feeling called you can choose a new color of silk or swap out some gemstones to match a new phase in your life or a new favorite outfit! We’re always changing.